If 2018 taught us anything, it's that celebrities aren't the most patient bunch when it comes to love. From Nick Jonas and Priyanka Chopra seemingly never ending blowout affairs to Michelle Williams' surprise vows to the rocker no one even realized she was seeing, those in the Hollywood set were declaring their forever matches and then rushing their way down the aisle. Or, in the case of Justin Bieber and Hailey Bieber, rediscovering their person had been in their orbit this whole time and deciding they should probably lock it down for good. Whatever the reason, whether it be baby fever, blind passion or just an altruistic desire to give us all some happy news to distract from the less pleasant headlines, plenty of crazy kids were falling head over heels and realizing they couldn't possibly wait another season to start their future. 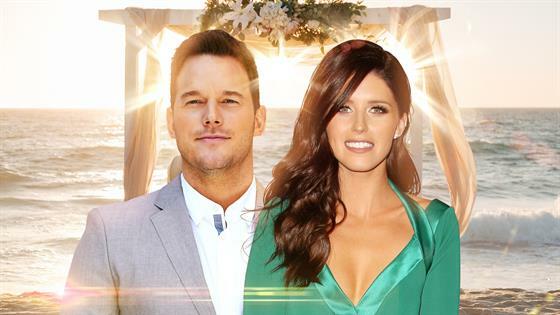 And now we can count Chris Pratt and Katherine Schwarzenegger in that same boat. Less than a year in, the endearing Parks and Recreation actor turned full-fledged action movie star and the political scion, a successful author and lifestyle blogger in her own right, were one of those when you know, you know couples. And now that the 39-year-old Jurassic World star has put an entirely impressive ring on it, they see absolutely no reason to delay the proceedings. In the lovable Minnesota-born, Washington-bred Pratt, "Katherine definitely found her Prince Charming," an insider tells E! News of the 29-year-old University of Southern California grad, daughter of legendary journalist Maria Shriver, 63, and body builder turned actor turned Gubernator Arnold Schwarzenegger, 71. "They are over the moon that he proposed and that they are taking this next step." And they'd like to make that move ASAP. "It will not be a long engagement," says the insider, noting that wedding plans were already well underway within days of Pratt dropping to one knee with the estimated 5-carat diamond. "There will be no expense spared," continues the insider, adding everyone involved "wants to give Katherine the perfect day." Doubtlessly that day will begin with a touching church wedding. After all, their shared devotion to their Christian faith is what brought them together both abstractly—one source tells E! News that Pratt "believes God put Katherine in his life,"—and in the very literal sense. When Pratt connected with Shriver during one of his regular Sundays at church, she saw the chance to play matchmaker for her eldest daughter, a woman so committed to her religion she often types out bible passages and spiritual quotes for her nearly 74,000 Twitter followers. Her intuition was spot on, of course. Like an increasingly growing sect of Hollywood, Chris credits much of his success to a higher power. "When I came to Los Angeles, I came from Hawaii and I had all of this blond hair and I was tan and I met an agent, because I really wanted to be an actor and get an agent, and he said, 'Wow. Bro you must surf?' And I said, 'Yeah,' and that was the first of many lies I told to get where I am today," he said while accepting the Teen Choice surfboard for Choice Sci-Fi Movie Actor. But also, he added, "I would not be here with the ease and grace I have in my heart without my lord and savior, Jesus Christ." The way Pratt sees it, spreading his love of Christianity is a way to give back for the many blessings he's received. At 19, he had already spent a spell as a stripper to make ends meet and followed that up by waiting tables at the Bubba Gump Shrimp Company by day and sleeping in his van at night. It wasn't as bad as it sounds, he swore in a 2014 interview with The Independent, because said ride was parked in Maui. "It's a pretty awesome place to be homeless," he said. It would be different if I lived on the streets of Chicago and ate garbage from a dumpster. We just drank and smoked weed and worked minimal hours, 15-20 hours per week, just enough to cover gas, food and fishing supplies. You know, it was charming time." But now that he's a certified movie star with a multimillion-dollar fortune that regularly earns him a spot on Forbes' list of highest-paid actors and dad to impossibly cute 6-year-old Jack Pratt, who survived a harrowing premature birth, well, he's got some things to be grateful for. Ari Perilstein / Getty Images for Feld Entertainment, Inc.
And if his open talk of bible study inspires someone else to check it out he feels he's done a bit of the Lord's work. "Nothing fills my soul more than to think that maybe some kid watching that would say, 'Hey, I've been thinking about that. I've been thinking about praying. Let me try that out,'" he recently told the AP. In Katherine he's found himself a willing apostle, someone who isn't shy about discussing her beliefs. "He's constantly around other people who have no faith or are apologetic about it, but not her," a source told People. "She is willing to talk about it to anyone who will listen." So friends have no doubt that they'll be singing a few hymns at their upcoming vows. "They're going to want a religious wedding," says the source. "I know that Chris does, and I assume that she does, too. God is going to be a part of this marriage." Their courtship has certainly followed the traditional route. Since the couple inadvertently went public with their Father's Day picnic, their dates have revolved around family. Already comfortable with children, Schwarzenegger quickly formed a solid relationship with Jack, the son Pratt shares with ex-wife Anna Faris. "Katherine is very bonded to Jack and really loves being around kids," said a source. "She has always been good with children, but she really shines and has stepped into this role perfectly. She knows her place with him and is there to have fun and support him." Likewise, Pratt understood it was important to win over Schwarzenegger's kin, including her parents and three siblings Christina Schwarzenegger, 27, Patrick Schwarzenegger, 25, and Christopher Schwarzenegger, 21. The duo's regular Sundays at church were generally followed up with family time at Shriver's L.A.-area spread, a home where Pratt became a fixture, joining her brood for Thanksgiving, her December birthday celebration and a New Year's trip to Cabo San Lucas, Mexico. He also charmed Arnold—the couple met up with the politician and girlfriend Heather Milligan for a November double date—and bonded with Patrick, the two taking in a Clippers-Raptors game court-side in December. It wasn't long before the whole blended clan were cheerleaders for Team Pratt. "Everyone loves him and has welcomed him with open arms," noted a confidante. "Maria is crazy about him and treats him like a son." Perhaps because he made it clear from the get-go that was his longterm plan. "Chris has been very straightforward about his intentions from the beginning," a source told People. "Over the last few months, he's been bonding with all of Katherine's siblings and it was clear to her entire family they would get married." Still, when it came time for him to plot out his proposal, he went through the efforts to make it all official like, requesting the blessing of both of her parents. "Maria was not surprised and knew it was coming," the insider told E! News. "They had discussed it at length and he asked her permission." It was an easy yes from everybody, including the bride-to-be, who didn't hesitate to agree to forever, later writing on Instagram, "Wouldn't want to live this life with anyone but you." Even Pratt's ex Faris got in on the approving act, revealing on her podcast, Unqualified, that he called the morning after his proposal. "I was like 'Ah! That's amazing,'" she said of her reaction, putting a swift end to any chatter that she would be anything less than fully supportive. After all, the exes had already walked the walk when it came to their vow to stay civil, meeting up with their respective partners (Faris has been seeing cinematographer Michael Barrett since late 2017) to take Jack trick-or-treating. "I knew that it was going to happen," she shared with her listeners. "I love her, and I love him, and I'm just so happy that they found each other." The way she sees it is now Jack has a bonus parent who adores him just as much as his mom and dad and her buddy Pratt has found the partner he so richly deserves. In fact, the Mom star, 42, is so supportive she even offered to play a role. The actress and author, who presided over the December nuptials of her podcast cohost Sim Sarna, shared, "I texted him back, 'Just want to remind you, I'm an ordained minister.'" Even without that particular combo standing at the altar, the nuptials will be a sight to behold. For his previous wedding to Faris, Pratt chose to go the under-the-radar route. After teasing to People that they'd probably make it official far from prying eyes and without a whole slew of guests, "We're going to defy convention and not plan anything big. We're just going to go on vacation and come back married," they did just that, exchanging vows somewhat on a whim during a tropical vacation. In Bali for a friend's wedding in July 2009, they learned there was a wedding package option and decided to just go for it. "It was a gorgeous ceremony that was just for the two of us," Faris wrote in her 2017 memoir Unqualified. "We had already told our parents that we were probably going to elope, and we'd promised them that we would have a party at home, too." It took three years, but they fulfilled that promise, hosting 70 people at a Washington lodge. "My dad officiated the ceremony," she shared, "and it was exactly the way we wanted it." This time, though, don't expect the Avengers: Infinity War actor to go the elopement route. "This isn't going to be a small wedding," a source told People. "Arnold and Maria's little girl is getting married. It's a very big deal. There will be no expense spared to give Katherine her dream wedding day." Which means they'll have to get to work, like, yesterday. Though their betrothal is only a week old, the ASPCA ambassador is already talking about a summer affair. And while that may be a quick turnaround for some brides, this one carries some clout even without her groom being a bold-faced name. There are few people Peabody Award-winning Shriver can't get on the phone and we'd guess former governor Arnold has some pull at most venues in the state of California. Nearby Martha's Vineyard—where Caroline's daughter Tatiana Schlossberg married medical student George Moran in 2017—is another option Schwarzenegger is considering. With a slew of Kennedy properties in the area, it's "a special place for Katherine and where she spent a lot of time growing up," an insider told E! News. And if it brings joy to the Maverick and Me scribe, that's good enough for Pratt. Said the insider, "Chris wants her to have her perfect day and whatever she wants." And that's a wedding with all the trimmings. "It will be big and very traditional," noted the insider. "Maria will be very involved with the planning." That starts with a series of festivities slated to kick off soon, with the insider reporting Shriver intends to throw an engagement party and bridal shower for her daughter in short order. "It's a very special time for the family and everyone is completely thrilled," said the insider. "They can't stop smiling and celebrating."